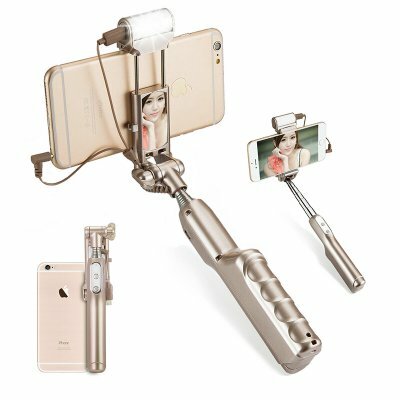 Successfully Added Selfie Stick For Android + iOS - 270 Degree Rotation, LED Flashlight, 1500mAh Battery (gold) to your Shopping Cart. Enjoy posting cool travel selfies or taking fun photos with all of your friends? Then, this 3-in-1 selfie stick will bring you lots of great moments and beautiful pics for your Instagram account. Coming with an LED light, a powerful battery and the option to take photos with both front and rear cameras, with this cool selfie stick you have everything you need. A selfie stick is a great tool for taking photos – and it’s not only about your own beauty shots. With a selfie stick, you can take great pictures with your friends, panoramic travel photos and lots of other creative shots — just use your imagination. And this 3-in-1 selfie stick will be just the right tool to make it all happen. The selfie stick is compatible with both Android and iOS smartphones and can be extended for up to 87 cm. It lets you take photos with both front and rear cameras and comes with 270 degree rotation for capturing great angles. The adjustable LED light is a great addition. With it, you are sure to take bright and clear photos in any lighting conditions. Plus, the LED light comes with a rotation funtion, giving you complete flexibility when creating your selfie masterpieces. A powerful 1500mAh battery will let you use the LED lamp for 72 hours non-stop. To get going, you won’t even need a Bluetooth connection or even download an app. Simply press the volume button on your smartphone to trigger the shutter. The Selfie Stick With Lamp For Android and iOS comes with a 12 months warranty, brought to you by the leader in electronic devices as well as wholesale selfie sticks.. Useful, easy to use, good quality, strong light, color as shown.